He has published many volumes of poetry, including Urban Myths: 210 poems: New and Selected. A selection of his poems appears in the Norton Anthology of Modern Poetry (New York, second edition, 1988). His recent books include The Floor of Heaven (Harper Collins, 1992), a book-length sequence of four verse narratives, At The Florida (UQP, 1993), which won the Melbourne Age Poetry Book of the Year award for 1993; Late Night Radio (1998) and several from Salt. 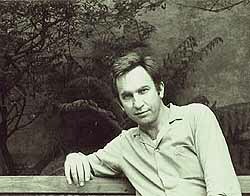 He compiled and edited (with Philip Mead) the new Penguin Book of Modern Australian Poetry (1992), published in Britain and the US in 1995 as the Bloodaxe Book of Modern Australian Poetry. that traffic, it’s going nowhere. of grieving fans, your fastidious manners. and sobbed when you were ten. Stay away from violent or distressing movies. of a child on an empty, rain-soaked beach. despite the migraine and the panic attacks. "Questioning and extending its procedures"? What is this profession again? Cosmetic surgery maybe?